LONDON – The Global Private Banking Benchmark 2014 from Scorpio Partnership finds buoyant growth across the top 25 firms worldwide [Table 1], which experienced an average percentage change of 11.3% in assets under management (AUM) in 2013. Together, this league of wealth titans now collectively manages more than 78%of industry AUM, a 1% increase from last year. UBS still leads the pack of global wealth managers based on year-end results for 2013, following a reported growth in assets under management (AUM) of 15.4% for UBS during the year in US dollar terms. The asset base of the Swiss giant is now just shy of the USD2 trillion mark at USD1,966.9 billion. The milestone marks a transition in the scale of global wealth management. At current growth rates the bank could reach this landmark before the year end. Tracking more than 200 financial institutions for 13years, the Global Private Banking Benchmark analyses key performance indicators across the private banking business model. This year’s worldwide ranking saw a number of notable changes. 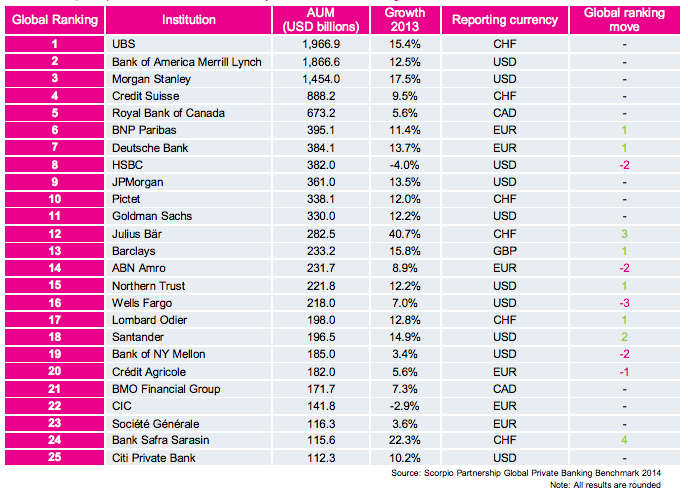 BNP Paribas and Deutsche Bank both crept up one position as HSBC slipped from sixth to eighth place. HSBC’s negative percentage change in AUM of the top 25 would appear to be due to its ongoing strategy of pulling out of non-core markets. By contrast, Julius Bär grew assets by a dramatic 40.7% last year, thanks in part to its continuing acquisition of Bank of America Merrill Lynch’s international operations. The Benchmark also finds that 2013 was a healthy year of growth for wealth managers across the industry, including US private banking. The average change in AUM for the over 200 Benchmark banks was 19.7%, more than double last year’s growth. This latest assessment reveals that the industry is now managing an estimated total of USD20.3 trillion in HNW assets, up from USD18.5 trillion in the previous year. Good performance in the financial markets contributed to the AUM increases, as did strong net new money (NNM). NNM inflows averaged at USD1.8 billion for the Benchmark banks. Although year-on-year NNM dropped -13.6% on last year’s growth rate; highlighting the extent of the buoyant growth in 2012. As the Eurozone crisis receded during 2012, returning client confidence boosted net new money to exceptional heights that year. Strong NNM through 2012 and 2013 also contributed to income growth. Wealth managers saw an average percentage change of 10.9% in income for 2013, reflecting increasingly positive investor sentiment. The findings demonstrate that the international wealth management sector is acclimatising to a ‘new normal’. Strong growth figures are commonplace, but so too are rising costs as the recovery is accompanied by increased regulation. Some firms are also continuing the strategy of trying to grow out of the malaise resulting in higher headcount costs. Cost income ratios now sit at 83%, up 3% from 2012. In spite of this increase, strong NNM figures meant that profitability was also nudged up on average 1.7% compared to last year, indicating that operators are learning to adapt to new challenges. When it comes to US private banking, Bank of America Merrill Lynch’s decision to sell its international wealth management operations in 2012 is just one example of a trend among US firms to retrench to the domestic market. As a result, this year’s Global Private Banking Benchmark introduces a new ranking to illustrate the leading US private banking and wealth management brands. There is considerable variation in the way US wealth management firms represent their assets under management. To the extent possible, the Benchmark seeks to exclude deposits, loans and client custody assets. Where firms segment results for their wealth business, the Benchmark focuses on the highest wealth segment. Based on this analysis, Bank of America Merrill Lynch and Morgan Stanley, as a consequence of their significant brokerage networks, remained by far the largest wealth managers in the US in 2013, with USD1,866.6 billion and USD1,454.0 billion in AUM respectively. Growth was strong across the leading eight US wealth managers and averaged a percentage change of 11.1% for 2013. 1 Bank of America Merrill Lynch’s Global Wealth and Investment Management division AUM includes Merrill Lynch Global Wealth Management and US Trust, Bank of America Private Wealth Management. The firm reports USD821.5 billion in AUM and a further USD1,045.1 billion of brokerage business for this division. We have excluded assets in custody of USD136.2 billion, banking deposits of USD244.9 billion, and loans and leases of USD118.8 billion for this client segment. 2 Morgan Stanley’s AUM reflects private clients assets for clients with accounts over USD1 million reported at USD1,454.0 billion. AUM for all clients of Morgan Stanley’s Wealth Management division stood at USD1,909.0 billion. Fee-based client assets are 37% of total AUM. 3 AUM for JP Morgan’s Private Banking segment of USD361.0 billion excludes assets held in custody, brokerage, administration and deposits. The addition of these activities gives total private banking client assets of USD977.0 billion. 4 Goldman Sachs’ high net worth client assets under supervision are USD330.0 billion. For comparison, the firm reports total assets under supervision of USD1,042 billion, which includes assets under management of USD919.0 billion, (those that earn a fee for being managed on a discretionary basis including mutual funds, hedge funds, credit funds and private equity funds for both institutional and individual investors), added to other client assets of USD123.0 billion, (those assets invested with third-party managers, bank deposits and advisory relationships earning fees). 5 Northern Trust’s AUM of USD221.8 billion for its high net worth client base does not include assets under custody (USD496.0 billion) nor trust, investment, and other servicing fees. Together these activities sum to USD1,166.0 billion. 6 AUM for Wells Fargo Wealth Management includes client assets and deposits of USD218.0 billion at the end of the fourth quarter 2013. Client assets for overall wealth, brokerage and retirement division was USD1,400.0 billion for 2013 year-end. 7 BNY Mellon Wealth Management provides investment management, custody, wealth and estate planning and private banking services to clients. BNY Mellon’s AUM has more than USD185.0 billion in private client assets. 8 Citi Private Bank’s AUM combines capital market assets (USD62.1 billion) and managed investments (USD50.2 billion). Citi Private Bank also manages deposits of USD80.8 billion and trust and custody assets USD101.9 billion. 1. Scorpio Partnership is a London-based strategy and research specialist on the global wealth management industry and codifying the HNW client journey. In addition to its industry benchmarking, Scorpio Partnership’s unparalleled insight into the market is based on over 40,000 interviews with millionaires and billionaires and 10,000 professional advisors across 35 global wealth centres. The firm has now undertaken enterprise-wide client journey insight programmes for 40% of the world’s largest private banking institutions. To date in 2014, Scorpio Partnership has either won or been runner-up for awards for Thought Leadership in Asia, Europe and the United States for its insight work in the respective regions (WealthBriefing). 2. The Scorpio Partnership Global Private Banking Benchmark is the leading analysis of the international wealth management market from strategists Scorpio Partnership. This year’s report includes data based on results from 209 private banks around the world with total assets under management of USD14.9 trillion. 4. The Global Private Banking Benchmark 2014 collects data from a representative sample of wealth management institutions around the world from which to develop industry key performance indicators. To ensure consistency in the analysis, we seek data relating to the firm’s actively managed high-net-worth private client assets, including discretionary portfolio management, advisory portfolio management, securities or brokerage accounts, own mutual funds, term deposits, fiduciary deposits, savings accounts and managed trust assets. More specifically, we aim to identify data relating to private clients who hold more than USD1 million (or the local currency equivalent) in actively managed assets with the firm. We note that not all firms conform to this reporting methodology. For further details on the reporting guidelines and the data reported for individual firms, please contact us directly. The report is available for purchase directly from Scorpio Partnership or through its publishing partners. For more information please visit our website www.scorpiopartnership.com.